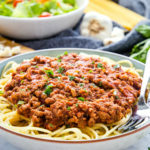 This Best Ever Spaghetti and Meat Sauce recipe is the perfect Italian-style weeknight family meal - a rich, meaty sauce served over your favourite pasta! Heat a large dutch oven pot over medium high heat. Add the ground beef and cook until almost completely browned, breaking it up with a wooden spoon. Turn the heat to medium and add the onions, garlic, salt and pepper (to taste), parsley, basil, oregano and thyme. Saute with the beef until the onions are soft and translucent. Add the wine and allow the liquid to evaporate while stirring the mixture regularly so the meat absorbs the flavour of the wine. When the wine has almost evaporated, add the crushed tomatoes and stir to combine. Cover and let simmer on medium-low heat for at least 30 minutes, or up to 2 hours (turn the heat to low if you plan to simmer for a long time). Stir regularly to ensure the sauce cooks evenly. Prepare the pasta according to the package directions, cooking it in salted water for best results. Serve the sauce over the pasta with a sprinkling of fresh parsley (if desired) and freshly grated parmesan cheese. This recipe is great for meal prep because the sauce can be prepared in advance and stored in the fridge for up to 3 days. Freeze in airtight containers for up to 2 months.